I can remember starting this website back in 2008 just before the original Army of Two was announced. It was like the stars had aligned - a major publisher decided to create a game solely around the idea of cooperative play just as we launched a website around the same niche. While we really liked the game at the time, even if it was a bit brotastic and generic. I still to this day don't understand the hockey mask aspect of the series - it just makes the characters feel so disconnected. After Army of Two: The 40th Day the series took a bit of a hiatus and many wondered if we'd see anymore. Army of Two: The Devil's Cartel is the next in the series and up until release it was billed as a more serious natured game tackling mature subject matter like Mexican drug cartels. Someone is either really good at misdirection or really bad at marketing. Early on through the game I told Mike that I was getting flashbacks of 50 Cent: Blood on the Sand while playing The Devil's Cartel. I don't know if it was the desert setting, the ridiculous dialogue, or the helicopter sections, but this game didn't feel very serious. Especially when you combine it with the new Overkill system which allows you to unleash devastation on the enemy with explosive force - it's almost an exact replica of that feature which is seen in BotS. Sometimes I think the developers just wanted to show off how you can blow up everything in the game's graphic engine, Frostbite 2, the same engine which powers Battlefield 3. And lots of stuff does blow up - over and over and over again. The story of The Devil's Cartel puts you in the shoes of two new Trans World Operations (TWO) recruits - Alpha and Bravo. While Salem and Rios are still around to play an integral role in the story you don't see them all that much of them. There's still weapon customization and even a deeper character customization section, but the game has dropped all other modes of play other than a two player co-op campaign. What's interesting is the game has a much quicker pace - it feels more arcade like - with each mission taking anywhere from 4-6 minutes to play. Don't worry, you'll blast your way through over 50 missions, so the game definitely isn't short. There's also a new scoring system in which players earn money for performing maneuvers and can combo and multiply what is earned by working with your co-op partner. For instance if you successfully flank an enemy while a partner is taking fire you'll get bonus points. Kill multiple enemies quickly and you can combo. The game tracks and tells you which combos you have complete and how many times you've completed them. All of this adds to the more arcade like and over the top feel of the game, especially when you consider a leaderboard is given to every single mission in the game. While some may find the dialog annoying, I really enjoyed how The Devil's Cartel didn't take itself seriously. Numerous times the characters broke the 4th wall - calling out red barrels and how they always explode, how tutorial sections are always ridiculous, and plenty of other meta moments. There's a few legitimately laugh out loud sections in the game with just how over the top things are. Army of Two: The Devil's Cartel feels like a very refined version of the series - it cuts most of the BS and sticks with what it does best. That's big fire fights and utilizing the aggro system to advance from cover to cover to take down enemies. For the most part missions are straightforward and every so often you'll have a vehicle or helicopter mission to break up the monotony. I still found that by 40 missions in I was getting a bit tired and just wanted to see how things wrapped up. There's not too much in the way in level variety - for the most part you'll be in Mexico working through drug cartel shanty towns, adobe buildings, and the occasional drug lord mansion. Co-op sections where you'll need to hoist your partner up or hold a door open are pretty few - they don't feel as forced. The sections in which you'll split up from your partner, mostly so one covers high while the other is down low, work well enough too and most times if you're partner is down you can make it to them to revive. The bottom line with The Devil's Cartel is this -if you enjoyed the series,even just a little, there's some redeeming value here. Especially if you've got a solid co-op partner to play with either online or on the couch, both of which is supported. If you're looking for something that breaks the gameplay formula of the previous games, you'll have to look elsewhere. This is still a brotastic shooter where you'll kill thousands of nameless soldiers for no apparent reason other than they like running into bullets. That seems like a pretty stupid thing to do, but as Bravo points out, “that's exactly what we do” the entire game. It's ok though, because we're f#@king awesome. 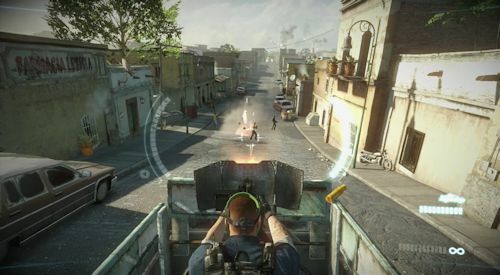 The Co-Optimus review of Army of Two: The Devil's Cartel is based on the 360 version of the game. A copy of the game was provided by the publisher for review purposes. 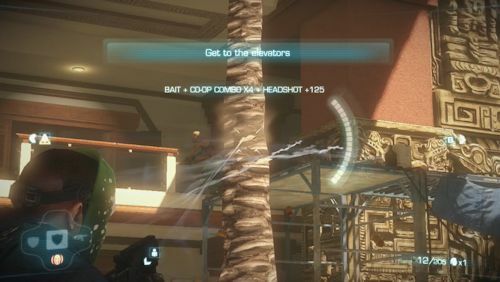 The Co-Op Experience: Two players can play in local split screen or online co-op through the campaign. Each player earns their own individual cash and players are rewarded bonus cash for working together.